Barefoot Books is an independent children's publishing company. I worked there from August 2011 to December 2013 as a graphic designer. Check out some of the fun projects I worked on! I worked on a variety of print initiatives at Barefoot Books. Using Adobe Photoshop and InDesign, I designed these Artist Series bookmarks featuring Carole Hénaff and Miss Clara's illustrations. In addition to providing table signage and digital slideshows for the Barefoot Books Studios in Concord, Massachusetts, and Oxford, UK, one of my favorite responsibilities was to brainstorm and execute window displays. I collaborated with many people to bring the displays to life including the CEO, our interns, and store merchandisers. 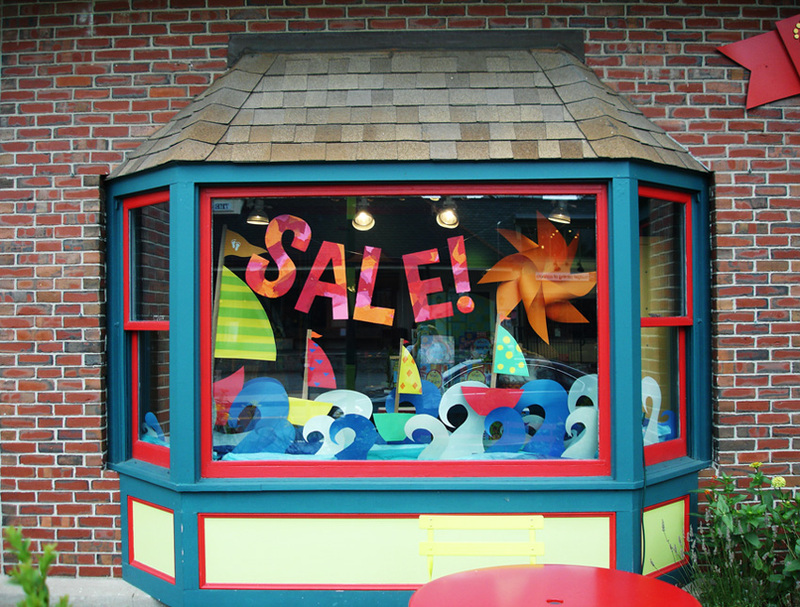 I designed and installed the Summer Sale window, with letters, waves and sailboats made by me. To coincide with new books, I designed over twelve art projects for families, such as this Paper Mobile activity. I worked with the interns to photograph and construct the designs. You can read all about it on the Barefoot Books blog, or you can download the activity. I designed many trade flyers and catalogues for Barefoot Books to highlight our latest titles, such as this flyer for Independent Readers. These were professionally-printed, but I also created print-at-home PDFs for our direct-selling Ambassador community. I created an extensive variety of web collateral for Barefoot Books. For these ads, I selected illustrations from our library and edited them with the Adobe Creative Suite. Illustrations are by Alison Jay and Miriam Latimer.